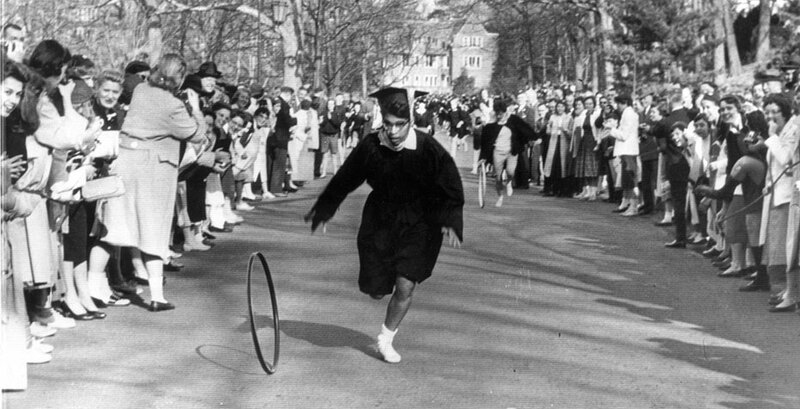 At 7 p.m. on April 16, women will gather in the living room of Tower Court to talk about two related experiences: being a student of African descent at Wellesley in the 1950s, and being a participant in a project collecting oral histories about that time and place. Several of the alumnae who gave oral histories will be present to speak about the collection, including Lois Leatherman Driver '57, Ruth-Arlene Wood Howe '55, and Shirlee Haizlip '59. The collection is titled Oral Histories from Wellesley Alumnae of African Descent of the Pre-Ethos Era. The event, called Quiet As It’s Kept, is free and open to the public, and is the brainchild of Nora Mishanec ’14. But it was not, she is quick to point out, a single-handed effort. Mishanec contacted Barbara Loomis Jackson ’50 about the possibility of doing an oral history and learned that Jackson’s granddaughter, Michaela Jackson-Smith ’16, is at Wellesley now. “I immediately emailed Mikey and we had lunch,” tells Mishanec. “Mikey was very excited to learn about the project, and she made plans to conduct an oral history with her grandmother.” Sadly, Jackson passed away before that could happen. Jackson-Smith has remained involved with the project, however; she and Mishanec jointly conducted the oral history with Ruth-Arlene Wood Howe '55, and she may continue the research when Mishanec graduates in May. The oral histories will find a home in the College Archives. Most will be publicly available, or will be available in future, depending upon the wishes of the subject.